The nearest recycling bins for Paper, Plastics, and Cardboard are located at the Chipping Norton Campsite. However, the campsite would appreciate if you could possibly try to use alternative locations in Chipping Norton (Lower Car Park) and Charlbury (Spendlove Centre) first as these tend to be emptied more frequently. Please contact us here if you’d like to set up a group in Chadlington. In Chadlington household refuse and garden waste (in special green bins) is collected every other week, whilst recycling boxes are collected weekly. 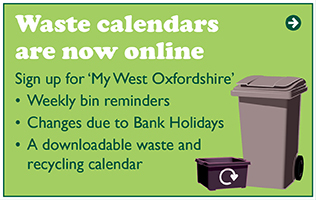 For a collection calendar and email alerts service for refuse and recycling collections at your property visit the My West Oxfordshire service provided by WODC. Here you can also download a version of the collection calendar to print and keep offline. WODC offers a collection service for bulky items of household waste. To book a collection please call 01993 861020. Standard items: £16.55 for up to 4 items and £5.25 for each additional item. Up to a maximum of 6 items per collection. For more than 6 items another bulky waste collection will need to be arranged. A refund can only be granted if the collection is cancelled at least 1 full working day before the collection date. Click here for WODC’s page including details of what can be collected. The nearest is Dix Pit waste and recycling centre. Disposal is free; but there is a charge for large-scale DIY items and items such as tyres cost £2.50 each. What can I recycle there? Materials recycled include household batteries, car batteries, electrical and electronic equipment, plastics, soil, rubble, green waste, cardboard, paper, light bulbs, sheet glass, fluorescent tubes, glass, metals, foil, cans, engine oil, timber and textiles.